On Friday, a report revealed snippets of Apple's California Department of Motor Vehicles self-driving car application, offering insight into the company's autonomous vehicle project. A full copy of the document has been shared with AppleInsider. Compared to the document summary offered earlier today, Apple's complete Autonomous Vehicle Tester (AVT) Program Application for Manufacturer's Testing Permit, acquired by macReports via a public record act request, reveals a bit more information about the safety driver certification process. AppleInsider has redacted certain identifying information from the application, including the culling of 18 pages of vehicle registration and related DMV documentation. Going beyond the cursory evaluation presented in the Business Insider report, Apple's application incorporates a copy of the testing process it used to certify the six drivers who will pilot three modified 2015 Lexus RX450h SUVs. 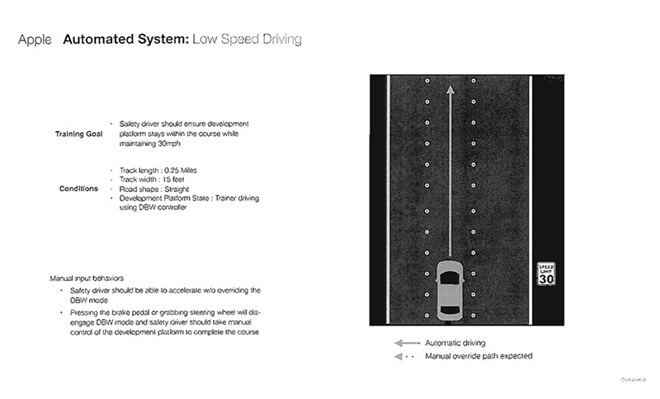 Included in the informational packet are instruction sets, training goals and diagrams for each of the following tests: low speed driving, high speed driving, tight U-turns, sudden steering input, sudden acceleration, sudden braking and lane change. The document also names six Apple employees who passed the company's autonomous vehicle tests and are thus certified to operate the platform. Three drivers have worked at Apple's Special Projects Group for two years as hardware and software engineers, according to their LinkedIn profiles. As can be expected, most test drivers are roboticists or have experience with robotics systems. Beyond the testing process and revelation that all six drivers have already passed Apple's certification, the application sheds a bit of light on the autonomous driving system's capabilities. For example, Apple expects its system to be capable of maintaining in-lane speeds of at least 65 miles per hour, change lanes automatically, brake when required and perform other basic functions. Whether Apple has developed more advanced functionality is unclear, but driving assistance features in products like those marketed by Tesla are already well ahead of Apple's testbed. As Uber and Google would undoubtedly profess, their self-driving platforms are also much more complex. Given Apple's propensity for secrecy, especially compared to the competition's very public efforts, the tech giant is likely researching advanced technology behind closed doors. The full application can be viewed below. Update: This story has been edited to further redact information from the original document in accordance with a California DMV request.